San Francisco Municipal Railway 1258 is a Boeing–Vertol Light Rail Vehicle. It is a three-truck, articulated, lightweight, steel car designed for either high or low platform loading. 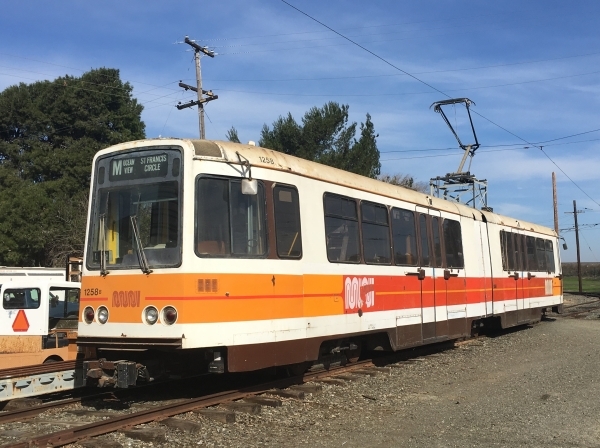 Car 1258 was built in 1974 by Boeing-Vertol in Philadelphia, Pa. Its development was funded by the Urban Mass Transit Administration, now known as the Federal Transit Administration, as part of a program to develop a standard light rail vehicle to replace the PCC car. Two groups of these cars were built, one group for San Francisco and one group for Boston. Due to the late completion of the MUNI‘s Market Street subway, some cars built for San Francisco were actually delivered to Boston and some of the Boston cars were actually delivered to San Francisco. This car was probably originally intended to be delivered to Boston. The car was retired by the MUNI when new cars for San Francisco were acquired from Italy. 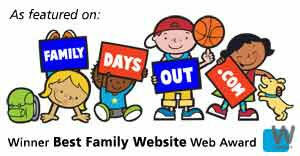 It was acquired by the Bay Area Electric Railroad Association on May 20, 2002. Technical Data: Lightweight three truck articulated LRV. Built by, Boeing Vertol Company of Philadelphia, Pa. in 1974. Seats, 68 passengers, one operator, maximum passenger capacity 219. Empty weight, 67,000 pounds. Trucks: Mono-motor with right angle drive to both axles, inboard journals, primary suspension is rubber chevrons, secondary suspension is air ride springs, truck frame and bolster are all welded fabrications made from HTLA steel. Wheels, 26-inch diameter resilient wheels. Axle. Journals. Traction motors, two 210 horsepower motors per car, forced air-cooled. There is no traction motor on center truck. Air Brake Equipment: Brake equipment, dynamic, disc, and magnetic track brake. Disc brakes are air over hydraulic. Air compressor. Dimensions: Width, maximum 8’ 10 1/4”. Length over couplers, 73’. Height, 11’ 6”. Truck centers, 23’ 0”. Truck wheelbase, 73”. Propulsion Equipment: Garrett Air Research. Master controller. Acceleration and dynamic braking, DC chopper thyristor controlled. Traction motors; Garrett shut wound with field control. Gearing, right-angle single reduction hypoid gear sets. Misc Data: Couplers. Pantograph. Maximum speed, 50 mph. Acceleration rate, max. 3.1 mphps. Braking rate, service 3.5 mphps. Braking rate, emergency (below 30 mph) 6.0 mphps. Braking rate, emergency (above 30 mph) 4.0 mphps. Jerk rate, 2.5 mphpsps. Minimum track radius, 32 feet. Current Condition: This car is in good condition and is operational. Proposed Future Treatment: This car needs to have pantograph replaced.